Welcome to the Local Services Ads Click Study! 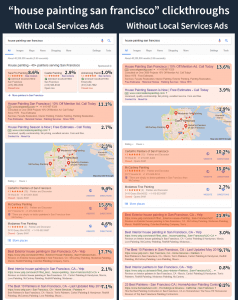 Local Services ads, or ‘Local Services by Google’ as they’re more formally known, are Google’s latest in-SERP advertising option for local and Service Area Businesses (SABs). What drives people’s decisions to click where they do? To do this, we enlisted more than 5,500 impartial internet users to help us find out how the emergence of Local Services ads impacts the way consumers use and choose local businesses in Google search results. If you’d like to find out more on the methodology, click here. Throughout the study, SAB and LSA expert Tom Waddington has provided his insights into what the findings show. A huge thanks to Tom for his excellent explanations! To stay up to date on the latest on Local Services ads, be sure to follow Tom on Twitter. 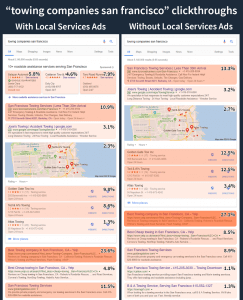 How Do Google’s Local Services Ads Affect SERP Click-through? Local Services ads were only shown to half of the testers. To see the full SERP heatmap, click on the above image. This heatmap shows the average across the ten tests, grouped by the type of click. You can view the individual SERP results heatmaps in the appendix below. The presence of Local Services ads affects the number of clicks for all other SERP types. When LSAs are present, 25.3% of all clicks are on paid results. When LSAs are absent, this is 14.6% – a difference of 10.7%. Organic results receive the most clicks of all SERP types, though they see a drop of 6.8% when LSAs are present. When LSAs are present, 55.8% of clicks are before organic results. For non-LSA SERPs, this is 48.7%. The local pack is the second most clicked-on SERP type, followed by PPC adverts appearing at the top of the page. PPC ads at the bottom of the page receive only a tiny proportion of clicks. To see the full SERP heatmap, click on the above image. This heatmap shows the average across SERPs for searches for five different SAB types. You can view the individual results pages in the appendix below. The hard-earned organic position 1 remains the most rewarding place to be for local business searches. More than a quarter of people chose this link in both test cases. 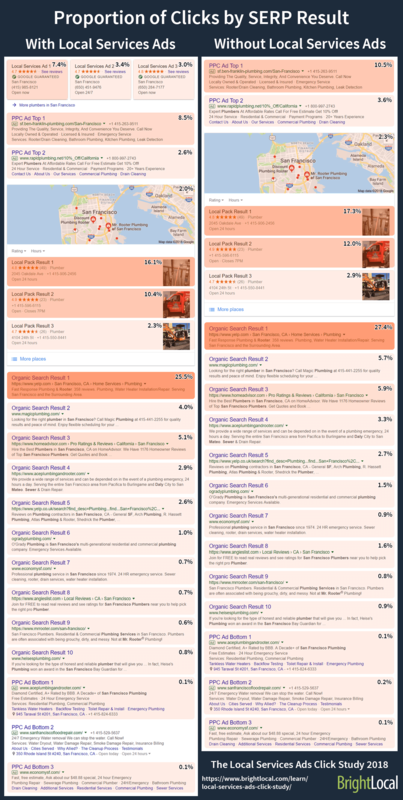 Interestingly, Yelp claimed the top organic spot for each of the 5 different results pages. You can read more on people’s motivations for clicks below. Despite their prominent position on the page, LSAs don’t currently dominate clicks. On average, 13.8% of clicks went to LSAs – with seemingly more going there if high or comparatively high star ratings were shown. Regardless of result type, position 1 is the place to be. LSA position one saw more than double the amount of clicks positions two or three got. Likewise, the highest PPC result got around triple the number of clicks of positions two or three, and around 100x the clicks of PPC ads at the bottom of the page. The local pack was a little more evenly spread, due in part to some outstanding features (explored in more depth below), but position one was still far more clicked upon than the other two. The above chart shows the main reason the testers said they chose the link across the whole results, grouped by SERP type. LSAs were only shown to half of the testers. Click here or on the image above to see a high-definition version. We provided the testers with a list of motivations for clicking their choice of link, as shown in the chart above. As expected, position on page still plays a huge part in influencing people’s decisions. 17.5% of clicks were chosen based on the position on the page of the result. Reviews are clearly an important factor in local SERP clicks, with 23.2% of all clicks motivated mainly by review numbers and ratings. Perhaps it’s no wonder that Google is the fastest growing review site. Online directories play a major role in local SERPs, with Yelp and other business listings websites taking prominence in the vast majority of the tests. 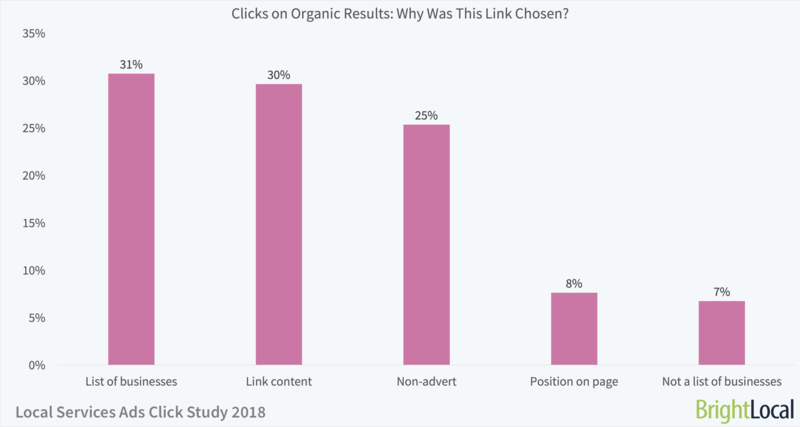 These were a key reason given for 14.52% of overall clicks, but it’s worth noting that 3.18% testers chose other organic results because they weren’t links to directories. While directories in local SERPs may be frustrating to the local businesses that want to hit the top spots, searchers in the research phase clearly find these very useful. Our Local Citations Trust Report found that 68% of consumers would stop using a local business if they found incorrect information in online directories – meaning it’s important for businesses to monitor their online presence beyond their own sites. Participants were heavily enticed by Yelp's #1 organic ranking and its "The Best 10 [business type]..." link content. Many consumers want to go to a single place that provides 'the best' companies to fulfill their need quickly. Google could rework the presentation of LSA to better capture the attention of these consumers. Why Do People Click Where They Do? Why do people click on Local Services ads? Why do people click on PPC results? Why do people click on results in the Local Pack? Why do people click on the Map? Why do people click on Organic results? The above chart represents the proportion of testers who chose an LSA result, split by their reasoning for doing so. Review ratings are by far the biggest contributing factor to clicks on LSAs. Looking at the different industry search tests, there appears to be a marked difference in clicks when the review rating of one is significantly higher than the others. In another test, the LSA in position 1 had a 3.6 star rating and received 5.8% of overall clicks, while the 4.5 star-rated LSA in position 3 received 7.9% of clicks. In Local Services ads, review ratings are pulled from Google My Business listings, as well as from the Local Services ad platform itself – rather than sourced from your overall online reviews as a whole. So if you plan to use LSAs for your local business, you’ll need to build positive Google reviews if you’re going to maximize your chances of getting clicks. LSA isn't taking away much from PPC here. PPC is getting 14.1% of clicks when LSA is absent and it only drops to 11.1% when LSA is present. It has been my opinion that a significant amount of people have been glossing right over the LSA results because the listings are not familiar and may seem to them like banner or product ads. If Google decides to educate consumers about LSA and what 'Google Guaranteed' means, LSA is where consumers will go. The above chart represents the proportion of testers who chose a PPC result, split by their given reason for doing so. These reasons cover both PPC ads at the top and bottom of the page. The most common reason given for clicks on PPC results is their prominent position on the page. When LSAs are present, PPC sees a smaller number of clicks – though this isn’t a straight-up replacement. 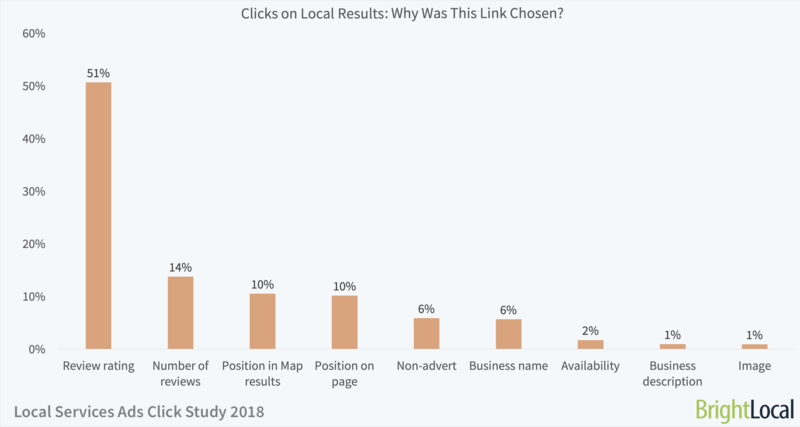 Clearly prominent results are important to a significant number of local searches, and taking these top spots still relates to plenty of clicks. In this study, paid results aren't getting many of the clicks overall (25.3% when LSA is present) but I think there's little doubt the number would be considerably higher on mobile. And voice search may still be low but I think it's worth mentioning that in four of the five categories in this study (plumbers, locksmiths, house painters, garage door pros), the results from Google Assistant would be 100% paid. The above chart represents the proportion of testers who chose a Local Pack result, split by their reasoning for doing so. As with LSAs, testers who chose local pack results were most likely to be swayed by review ratings, followed by the number of reviews the business had. In fact, this was the biggest motivator of all clicks across the study. In one test, the local business in local pack position two (star rating 5) outperformed position one (4.3 stars). One other interesting test saw Local Pack results 1 and 2 each have a 4.9 star rating, while the result in the third position had a 5 star rating. However, the business in position 2 showed a positive review snippet – likely contributing to its winning clickthrough rate. It's not surprising to see that reviews are such a huge factor and help draw clicks to both LSA and local listings. Businesses absolutely have to pay attention to this and work on improving their rating (preferably by providing great service, communicating with customers to address concerns, and learning from mistakes that may have led to bad reviews in the past). Google My Business reviews count toward your rating on LSA but not the other way around. You need to work on getting reviews in both, but don't go all in on LSA reviews and neglect your Google My Business listing. If you're only going to focus on one, make it Google My Business since reviews there count in both places. The above chart represents the proportion of testers who clicked on the map above the local pack results, split by their reasoning for doing so. 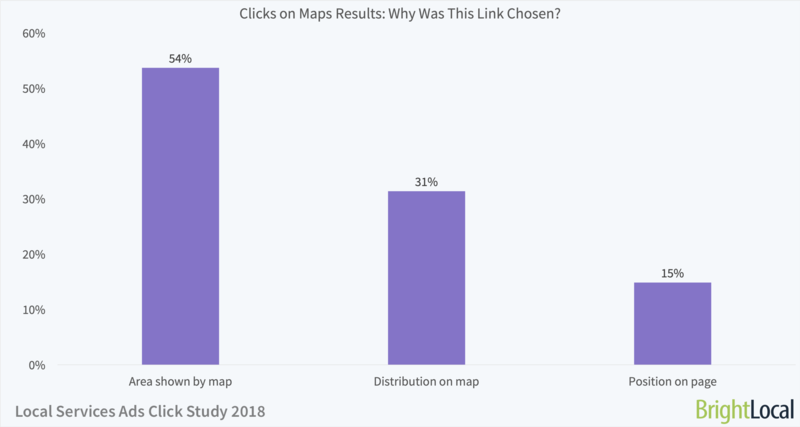 While map clicks only contributed to a small proportion of overall clicks, it’s interesting to see that the area and distribution of the map both outweigh the fairly prominent position of the map in local SERPs as reasons for clicking. The above chart represents the proportion of testers who chose an Organic result, split by their reasoning for doing so. Organic results were chosen due to a variety of factors, with a significant proportion opting to click on results because they knew they would lead to a list of businesses, rather than choosing a supplier directly from the SERPs. 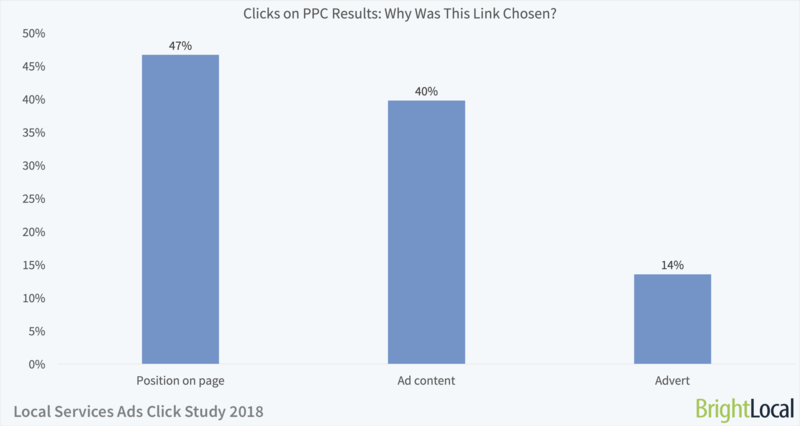 The link’s content is also very important, with a third of organic clicks attributed to the titles and descriptions that appeared in the result. Not only do these need to be optimized for search engines, but they need to be descriptive enough to entice searchers in. A quarter of organic clicks were also made because the searcher deemed organic results more worthy than paid results. Organic results don’t appear until about halfway down the page, especially when LSAs are in use, and yet many searchers still opt to scroll to these more ‘traditional’ search results. While every SERP is different, we’ve explored some quirks of each of the five SAB results that we believe may have played a part in people’s clicks. To see the full results of the individual tests, click on the image to see a larger copy. If there are any further factors that you think may have contributed to local clicks, let us know in the comments below. The first LSA result has a lower star rating than those in positions 2 and 3. This could contribute to position 2’s higher clickthrough rate. Where position 3 matches position 2, people appear to prefer to click on position 2. The Local Pack has a fairly significant range of review ratings, with positions 1 and 3 outperforming position 2 – and position 1 significantly outperforming position 2 in a much higher volume than any of the other tests. This SERP has 3 PPC ads at the top and a further 3 at the bottom. This was the only test where this happened. The first three organic results all link to different Yelp lists, with the first organic business sitting in organic position 4. LSA 1 has ‘handyman’ in the title, while LSA 2 and LSA 3 have ‘construction’ – none of which are really related to garage door contractors. Tom Waddington explains this below. Google is incorrectly associating the query with the Handyman category instead of the Garage Door Pros category. A search for 'garage door contractor (singular) San Francisco' produces garage door company results in LSA while the plural version produces handyman results. This was possibly due to handyman being a category in use in that market way before the current version of LSA... back when garage door wasn't yet a category. I believe 'repair garage' or something similar was a job type for handyman. Once the garage door category was added it seems Google may have neglected to update which ads are triggered for that query. In this SERP, all of the LSAs have a 5-star rating. Position 1 significantly outperformed 2 and 3. PPC Top 1 includes a deal – this could be a contributing factor for the comparatively high share of clicks in this test. Both PPC Top ads contain the CTA to “Call today” – though only the first one includes a phone number extension in the advert to do so. All local pack results in this test had strong review ratings, though Local pack result 2 contains a positive review snippet (and significantly outperformed position 1). Position 3 had a perfect 5 stars, yet performed the worst of the three. This could be because its review rating was based on far fewer reviews (just 2 reviews, compared to 15 and 61). This test had the lowest proportion of clicks on Organic position 1. The first four organic results were for Yelp, with niches (“exterior” and “interior”) being in first and second place. The first business website result was in organic position 8, with another in position 9. All other organic results were links to directories. The first LSA has a 5-star rating, while the other two have 4.3 stars each. This was the test with the largest disparity between LSA clicks. Yelp took the top 3 organic spots, with the first business sitting in position 4. This position outperformed positions 2 and 3 in terms of clicks. The LSA review ratings in this test are very similar to each other, with the 3rd receiving the highest review rating (and comparatively high clicks for this position.) The majority of those who clicked on this option said it was because of the review rating. The phrase “discount” may have also influenced clicks. The first business website in the organic results is in position 2. There were 6 businesses in the organic top 10. Three PPC ads were at the bottom of the page. Many businesses are reluctant to sign up for LSAs for various reasons. While results will vary from one business to another, every business that is eligible to participate should give it a shot. It's not the only place you need to be in the search results, but it is a place you shouldn't neglect. The first LSA has a lower star rating (3.6) than those in positions 2 and 3. The third LSA has the highest star rating, and the highest click rate of the three. All three businesses in the local pack had quite low star ratings, though these were on a par with each other. The business in Local Pack position 1 received fewer clicks than the equivalent business in the other tests. The organic results contain a lot more of business websites than directories. Only the first two and last organic results were links to directories. 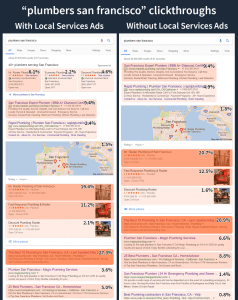 Using Amazon Mechanical Turk, we asked 5,500 testers to look at five different SERPs for Service Area Businesses – with half of the respondents viewing Google search results with Local Services ads, and the other half viewing SERPS without LSAs. Testers were requested to pick the search result that they would choose if they were looking for one of following five types of SABs in San Francisco: Locksmiths, Plumbers, House painters, Towing companies, and Handymen. Once they had made their choice, they were then asked to let us know why they chose this specific link via a multiple-choice question. 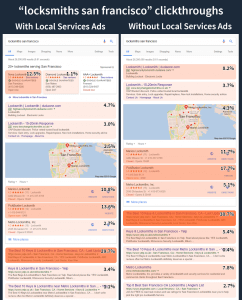 Information is split into overall trends for LSA and non-LSA results; heatmaps and key findings for the overall SERP clicks, and for each test; and type-by-type. If you have any further questions on the data, please get in touch on content@brightlocal.com. 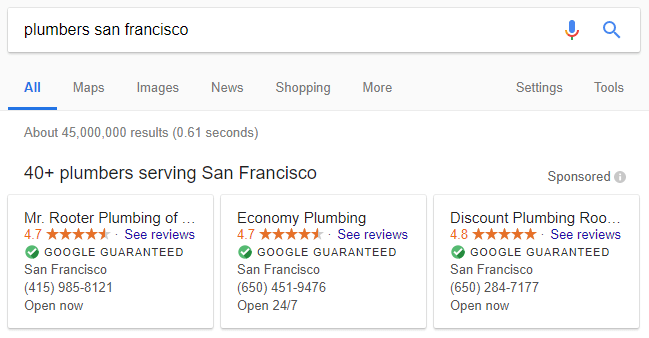 What do you think about Local Services ads by Google? Let us know your experiences in the comments below.